History: (What If? II#48) - After the drug-addled Nuke had laid waste to much of Hell's Kitchen, New York, at the behest of the Kingpin, he was attacked by a helicopter and took helicopter fire to the chest. Daredevil, who had been battling Nuke, quickly put Nuke into a cab and used his superhuman senses to drive him to a hospital, not wanting Nuke to be killed. Daredevil managed to make it to a local hospital, where the doctors went straight to work on Nuke's chest wound. Hearing that Nuke would live, Daredevil started to leave the hospital until he looked over at a policeman and thought about Kingpin. 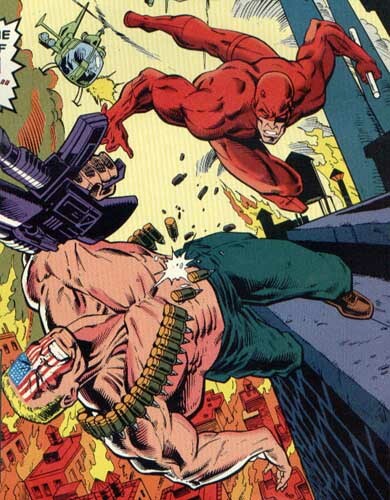 Almost instantly, the policeman opened fire on Daredevil, while the other policeman attempted to kill Nuke for his failure to the Kingpin. As Daredevil defeated the policemen, the doctors arrived to find Nuke's room empty except for the defeated policemen. While Daredevil escaped the hospital, the Kingpin hired Bullseye to make up for Nuke's failure. The Kingpin ordered Bullseye to bring Nuke back to him and informed him that Daredevil would be Hell's Kitchen. Back in Hell's Kitchen, Daredevil had brought Nuke to the basement of an apartment where he and Karen Page tried to tend to Nuke's wound. Karen Page tried to talk Matt Murdock out of keeping Nuke in that basement and then she left to get food for the two of them, leaving Matt to think about the consequences of his actions against the Kingpin. After a while of Karen Page being gone, Daredevil thought to himself that something had to be wrong and he went out into the night to find her. Daredevil soon found Bullseye waiting for him atop a local building and the two battled as Bullseye explained to Matt that the Kingpin had Karen and wanted Nuke in exchange for her life. Bullseye then made his escape and Daredevil returned to Nuke's side, where he explained to a now-conscious Nuke that one of "their girls" was missing and that the "boys" were fine. Nuke asked who had "their girl," but Daredevil replied that he couldn't send Nuke back out to the "front lines" and that this was his mission. Daredevil then let Nuke loose on the city and made his way to the Kingpin's building where he explained what he had done. Angered, the Kingpin ordered Bullseye to kill Karen Page, but before he could do so, Nuke smashed through the Kingpin's window, holding an American flag and calling the Kingpin a traitor. 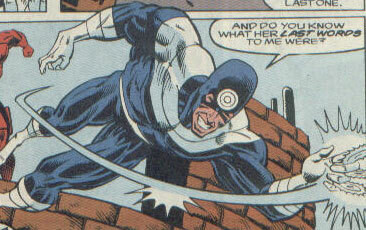 Daredevil took the distraction as an advantage and jumped on Bullseye to save Karen. A short battle began between the two until Nuke grabbed Bullseye and snapped his neck. Nuke then told Daredevil to "be a good soldier and get their girl behind the lines." Daredevil tried to protest, but Nuke repeated himself and punched Daredevil in the face. Nuke then turned his attention to the Kingpin and the two battled each other until Kingpin managed to shoot Nuke in the chest, knocking him from the building and onto the street, where he died. Unfortunately for the Kingpin, Ben Urich was there to see Nuke hit the street and he then wrote an article explaining how the next few weeks would go poorly for the Kingpin, as he was charged a criminal and went to trial for murder with Daredevil as a witness. Comments: Created by Ron Marz, Kevin Kobasic, and Andrew Pepoy. This alternate Earth diverged from the events seen in Daredevil I#230-233 (May, 1986-August, 1986). After Nuke was saved by Daredevil, the Kingpin hired Bullseye to bring Nuke back. Bullseye kidnapped Daredevil's girlfriend, Karen Page, and held her hostage for the Kingpin until Daredevil came out into the streets of Hell's Kitchen looking for her. Bullseye caught with Daredevil and explained the situation while he battled Daredevil. He then made his escape back to the Kingpin and sat with a knife to Page's throat while Daredevil met with the Kingpin. Angered at Daredevil, the Kingpin ordered Bullseye to kill Karen, but Nuke smashed through the window. Distracted by Nuke, Bullseye was attacked by Daredevil until Nuke grabbed Bullseye and snapped his neck, effectively killing him. Daredevil was the same as his Earth-616 counterpart, up until he saved Nuke's life from the Kingpin. Soon after, the Kingpin had Bullseye kidnap Daredevil's girlfriend Karen Page, whom the Kingpin used a hostage to exchange with Nuke. Daredevil soon met with the Kingpin and explained that he had set Nuke loose into the streets of Hell's Kitchen to prevent the Kingpin from killing him. Angered, the Kingpin ordered Bullseye to kill Karen, but Nuke smashed through the window wanting vengeance on the Kingpin. Daredevil jumped on Bullseye during the distraction and the two battled until Nuke snapped Bullseye's neck. Nuke then told Daredevil to get Karen Page out of there and when Daredevil protested, Nuke punched him in the face. Nuke was soon shot by the Kingpin and knocked out of the skyscraper, hitting the streets below. Ben Urich was there to witness it and he wrote an article that brought criminal charges against the Kingpin. The Kingpin eventually had to stand trial for murder, with Daredevil acting as a witness. After the article was published, Daredevil had a somewhat happy life with Karen Page. 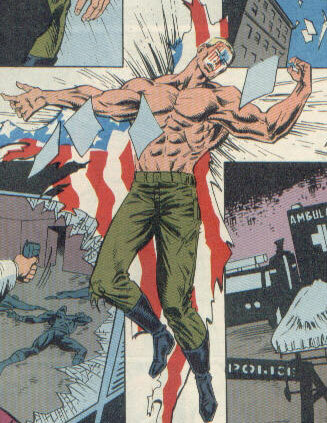 Nuke was a drug-addled soldier, like his Earth-616 counterpart up until Daredevil saved his life from the Kingpin. When Nuke had somewhat recovered from his wounds, Daredevil released Nuke into the streets of Hell's Kitchen. Nuke made his way back to the Kingpin, demanding vengeance. He snapped Bullseye's neck and then ordered Daredevil to get Karen Page out of the building. 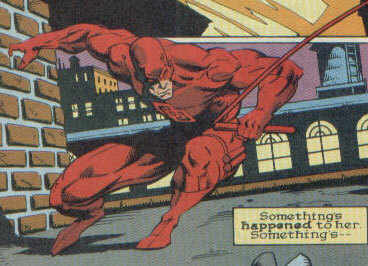 When Daredevil disagreed, Nuke punched him in the face and then confronted the Kingpin, only to shot in the chest and knocked from the skyscraper into the streets below. Ben Urich was there to witness it and he wrote an article that brought the Kingpin up on murder charges.